Almost all the latest smartphone and tablet devices that require an operating system prefer Android at present. It has numerous uses and can make using your smartphone, tablet, or gaming devices operate effectively. After learning about its multiple advantages you may be interested in getting a new Android device for yourself. Do check the underlying features though and focus on the firmware it offers. You will be amazed to know that Stock ROMs come with the device and is pre-installed; it is the default firmware for all Android products. Quite a few developers are not too eager to use the obvious though and they try to tweak the open source and customize the firmware as per their need. Many third party developers have also joined the bandwagon for selling their own Android Custom ROMs for Android devices too. Do you really stand to gain by altering the Android Stock ROM or is it just bravado on part of the young wannabe developers who want to do something different and earn handsomely in the process? Well, there are a number of advantages associated with the standard Android Stock ROM as there are disadvantages. Do take a look below and find out whether the default firmware is equipped to meet your needs. Retaining the Warranty: Opting for Customized ROMs for your new Android device is likely to make your warranty null and void. You thus lose out on the advantage of getting a faulty device replaced or repaired free of cost. This is exactly the reason why most of the users shy away from tweaking the code and getting a customized version installed instead. Quality Apps: You also get the advantage of numerous pre-loaded apps for you to use. Try checking the news & weather or change the wallpaper by sifting through hundreds of them, you can also opt for widgets as well as listen to music or book show tickets while you play an exciting game via your Android phone or tablet. Checking the social media is an added advantage too whereas your Customized ROM will not allow using all the top apps provided by a number of vendors. The most coveted apps are usually found in the pricey models though. So think twice before you lose them. 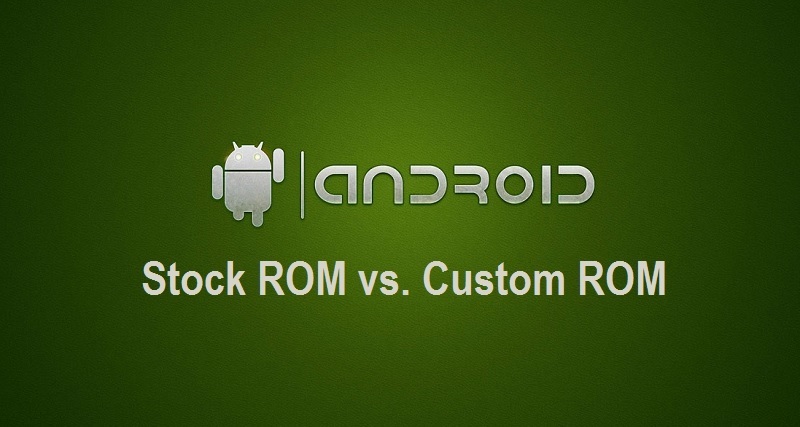 Features: The Stock ROM installed Android device is famous for its host of cool features. You would definitely not think of replacing them with less than perfect versions or opt for paying extra for the features that could have been yours before. The Swype feature for your keyboard is definitely a feature that will prove to be most useful. Add the android launcher or the custom home screen features and you will be reluctant to let go. Security: Android has become synonymous with reliability as far as security is concerned. An unaltered device is not likely to contain any malware's or spyware's that might make your Smartphone easily accessible to hackers. While you can check the source code for your Custom ROM before installing it, you just cannot be sure that it will prove to be 100% trustworthy. Although the advantages outweigh the disadvantages considerably, It is best to be acquainted with the unwanted side of Stock ROMs as well. Updates are not too frequent and often get delayed for months posing a serious problem for users who want to remain abreast of the new technology. The preloaded apps are not simple to remove especially for a user who does not have technical knowhow. Battery life remains limited when you retain the Default ROM that operates with most of the software’s running in the background.